Kick off summer with a backyard BBQ. BBQs are about enjoying good weather and seasonal ingredients in a laid-back setting, so don’t let yourself get bogged down with a million tasks. Use these entertaining tips to help you focus on the party, not on the planning. Make use of nice weather to entertain outside, but ensure guests have plenty of shelter from the sun. Gather tables or picnic blankets in a shaded area. Also, be certain to keep perishable food cold. Because of sunshine, do a little extra thinking and bring extra towels, sunscreen, baseball hats, or whatever guests may need to stay comfortable under the sun – and never underestimate how much ice you might need! For the menu, nothing beats a classic selection of chips and dips. 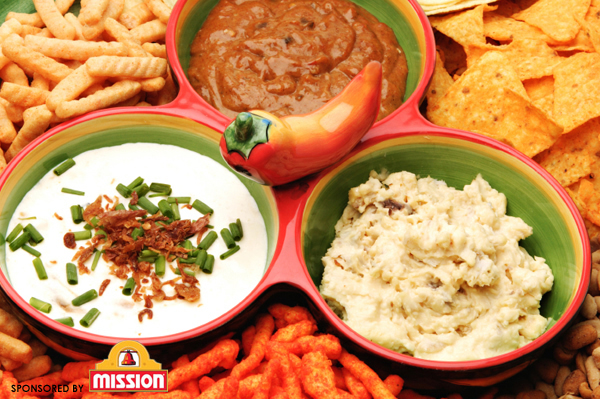 If you get creative with your dips, you can turn a classic snack into a gourmet treat. Spooned into ceramic bowls, the red, green and orange colors of these dips make for a lovely presentation. But you can also kick things up a notch by adding a few simple ingredients. Mash black beans to a smaller size/paste with a potato masher or use the tines of a fork. Add mangoes, mango juice, onion, cumin, cilantro, and lime juice; combine evenly. Serve cold with chips. To prepare, thaw spinach overnight in the refrigerator. The next day, drain the spinach and squeeze out as much water as you can. Combine spinach and remaining ingredients in microwave safe bowl. Microwave the dip for 15 seconds, stir, and heat an additional 15 seconds until hot. Serve hot with chips.